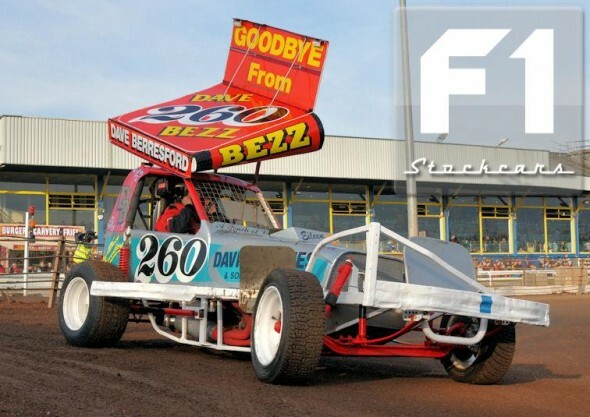 Popular BriSCA F1 stock car driver Dave Berresford 260 bowed out from BriSCA F1 stock car racing at the final Belle Vue meeting of the 2011 season in a career that spanned a massive five decades, running from 1971 to 2011. He partially retired in the late nineties due to a neck injury but returned in 2008, qualifying and taking part in the BriSCA F1 stock car World Final at Ipswich, but unfortunately his engine blew. Bezz also turned out for the 2009 season, much to the fans delight. Renowned for having beautiful, immaculately turned out cars, Dave was a driver that fans took to their hearts. Career highlights include winning the prestigious British Championship in 1988 and winning a tremendous forty nine finals in his career. At Final time, Dave Berresford completed a parade lap in front of a rapturous full house with his ‘Goodbye from Dave Bezz’ wing lit up with fairy lights. Final wins courtesy of BSCDA Historian Nigel Anderson.